We were discussing the various basic concepts such as Euler’s Equation of motion, Bernoulli’s equation from Euler’s equation, derivation of discharge through venturimeter and derivation of discharge through Orifice meter, in the subject of fluid mechanics, in our recent posts. We had already seen the application of Bernoulli’s equation in the working principle of Venturimeter and orifice meter. Now we will go ahead to find out the other practical applications of Bernoulli’s equation, in the subject of fluid mechanics, with the help of this post. Today we will see here the basic concept of Pitot tube and also we will secure here the expression of velocity of flow at any point in the pipe or channel with the help of this post. Pitot tube is basically defined as a device which is used for measuring the velocity of flow at any point in the pipe or a channel. Pitot tube works on the principle of Bernoulli’s equation. If the velocity of flow at a point decreases, pressure will be increased at that point due to the conversion of kinetic energy in to pressure energy. Pitot tube will be made of a glass tube bent at right angle as displayed here in following figure. Lower end of Pitot tube will be bent at right angle and will be directed in upstream direction as displayed here. Due to conversion of kinetic energy in to pressure energy, liquid will rise up in the glass rube. Rise of liquid level will provide the velocity of flow at any point in the pipe or a channel. Let us consider one pitot tube as displayed here in following figure. Let us say that water is flowing through the horizontal pipe. h = Rise of kiquid in the tube above the free surface. Let us recall the Bernoulli’s equation and applying at section 1 and section 2. In an incompressible, ideal fluid when the flow is steady and continuous, the sum of pressure energy, kinetic energy and potential energy will be constant along a stream line. 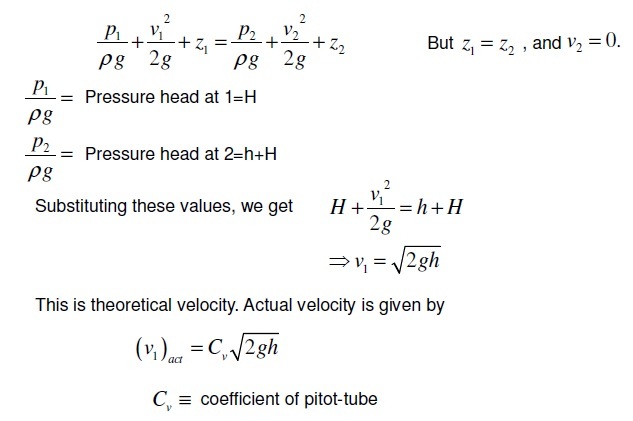 Assumptions made for deriving the expression for velocity of flow at any point in the pipe or channel is as mentioned here. 1. Fluid is ideal, i.e. inviscid and incompressible. We will have following equation after applying Bernoulli’s equation at section 1 and section 2. 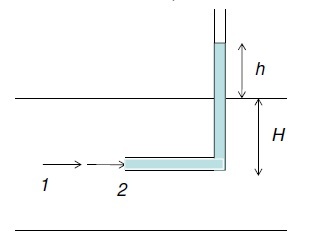 We will now find out the momentum equation, in the subject of fluid mechanics, in our next post.